Vikki Brueggeman was a self-funding novice when she started working for Zimbrick in 2001. Zimbrick has been a member of The Alliance since 1990. Brueggeman jumped in with both feet and became an expert in self-funding. 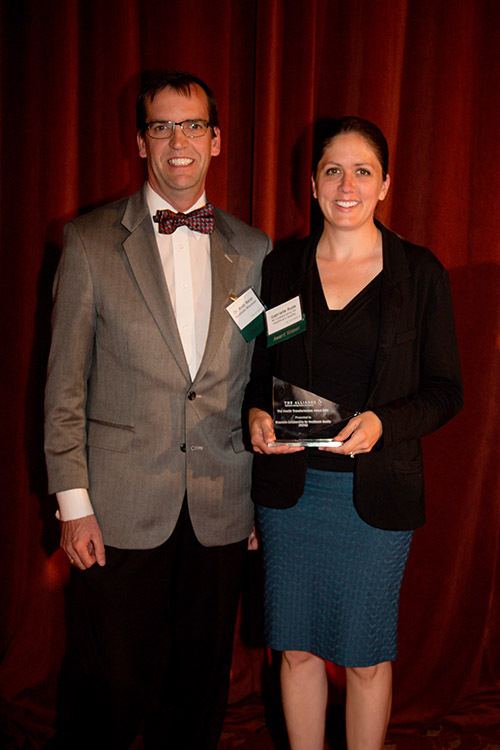 She learned how to construct self-funded health benefits that best fit Zimbrick’s employees and their families. 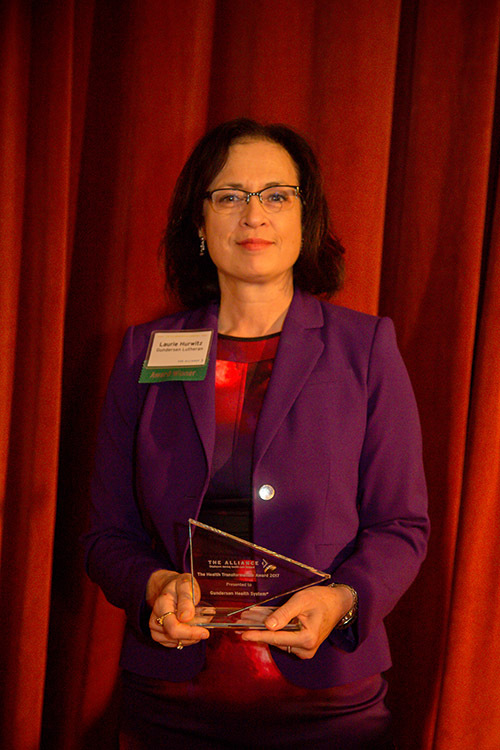 Brueggeman credits The Alliance’s Learning Circle events and service on The Alliance’s Board of Directors for her knowledge. We asked Brueggeman for her advice on how to optimize membership in The Alliance – both for you and for your organization’s employees and their families. How would you describe The Alliance to a Human Resources colleague who was unfamiliar with the organization? You’re part of a well-respected organization that is changing the world of health care benefits. It’s a small organization that carries a big stick. They have built a great reputation in the community and their greatest asset is being a trusted resource for employers and the employees of member employers as well as medical providers. 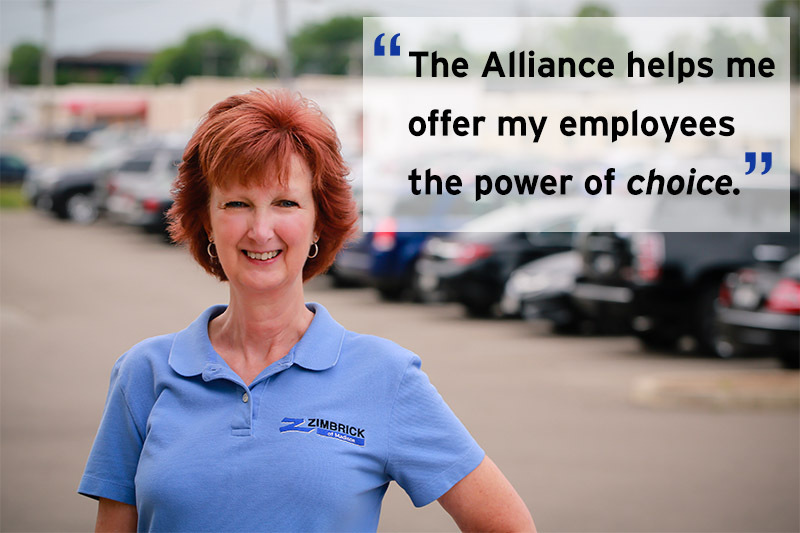 The Alliance helps me offer my employees the power of choice. What would you say to someone considering attending an Alliance Learning Circle (ALC) event? Go. Just go. Alliance Learning Circle events help you understand all of the different moving pieces in a self-funded benefits plan. You’re going to come out of this afterward saying, “Why didn’t I do this sooner?” The real value of attending an ALC is obtaining a broader perspective about health benefits. I count on The Alliance to do the things that I want to do, but have no power to do [by myself.] 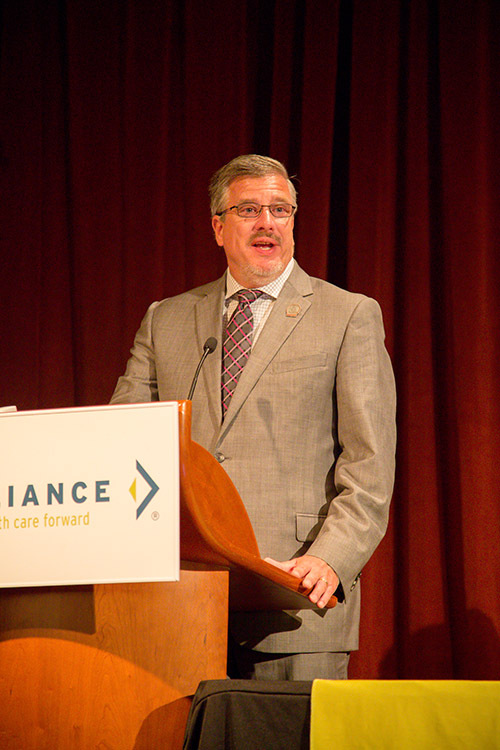 Like, The Alliance’s continued commitment to improving the health care in a positive way. ALCs encouraged me to be more open-minded and willing to challenge the norm [in health benefits.] They helped me to challenge my broker and say, “That’s not good enough. What else can we do?” That’s what The Alliance does. It encourages you to challenge things. Check out our upcoming Alliance Learning Circles. View our Events page. 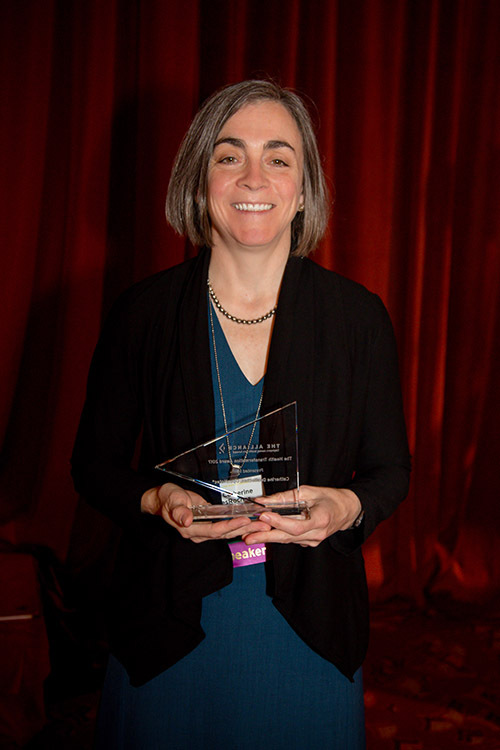 You served on The Alliance Board of Directors from 2007 to 2013 and were Chair of the Board in 2013. What was it like? And what would you say to someone considering service on The Alliance’s Board of Directors? You don’t need any special skills to be on the Board. You do need to speak up, share your opinion and be willing to challenge the norm in health care. It’s an incredible experience to be a part of an organization that is so committed to positive change. One benefit of being on The Alliance’s Board of Directors is being surrounded by other professionals and learning from their communication styles. I learned from The Alliance’s President, Cheryl DeMars, to always be open to feedback. Cheryl would always say, “Tell me more.” And I’ve used that in situations where instead of becoming defensive, I’d say, “Tell me more.” Because that opens the doors to communication. You learn a lot by being on the Board and you get to participate in this organization that is moving health care forward. Making changes little by little. The Alliance is an inspiring place. Learn More about The Alliance Board of Directors. Zimbrick added The Alliance’s QualityPath® program to its 2017 health benefits. How did you explain the benefits of the program to your employees? And how would you suggest that other members do the same? Know your employee population and what’s most important to them. And I’d suggest that employers use examples that are understandable to their own employee populations. Zimbrick sells and services cars and other automotive vehicles. Our employees understand engines. That’s how I created an analogy between QualityPath procedures and engine repair. So, if you have a knee replacement [or other QualityPath procedure] and something goes wrong, who’s going to pay for that? You? Or the doctor? Shouldn’t the doctor pay for that? That’s when I saw the light bulbs turn on above the heads of the employees. They understood the value of QualityPath’s warranty. Learn more about the QualityPath program. You’ve personally been a part of The Alliance for 15 years. 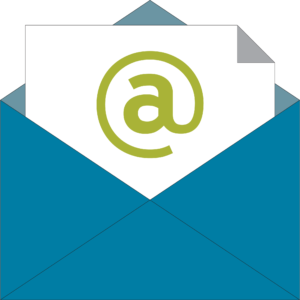 Do you have any final thoughts that you’d like to share with prospective members? The successes at The Alliance nowadays are so much bigger than they were 15 years ago. QualityCounts® was groundbreaking data to hold hospitals accountable. Now, hospital quality data is more commonplace. You’re part of an organization that is really changing things. And self-funding is the cheapest way for us to provide the best health care benefits by cutting out the middleman. We want the best for our employees and their families. Got questions about self-funding? We have the answers for you. Read about how Zimbrick transitioned to self-funding their health benefits in our case study. Hear what Vikki has to say about our Find a Doctor tool in our “Three Reasons Employers Love Find a Doctor” video. 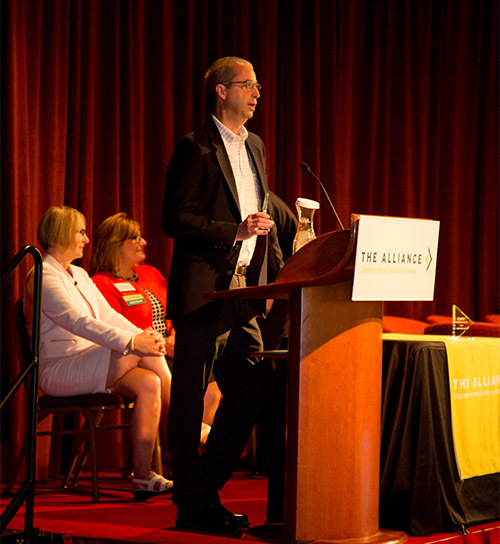 Fellow Board Member Kevin Lamp talked to us about “Why Being Engaged in The Alliance is Essential” in our December 2016 blog post.